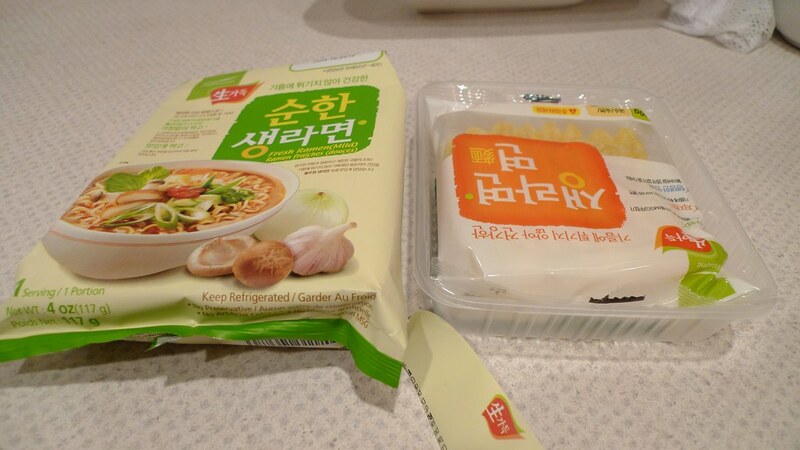 Don't ask me what the official name of this instant ramen is because I cannot read Korean. The only thing I know is that the company that makes it is called Pulmuone and under their large title is "Fresh Ramen (Mild)". So, I'm calling it Pulmuone Fresh Ramen - Mild. *shrugs shoulders* I have a feeling that as I dive deeper into the world of ramen, I'm going to find items that I will not know the name of. Please feel free to correct me if I am ever wrong about a name or background of something I review. Anyway... to the review! I've had refrigerated and frozen instant noodles before, but nothing like Pulmuone's Fresh Ramen. It's shaped in a brick just like Top Ramen or Maruchan, but it's soft. It had a plastic look to it, and it also had a plastic smell. Not very appetizing. It makes me wonder exactly how "fresh" these noodles are. Still, I cooked this one up using the exact instructions on the back. 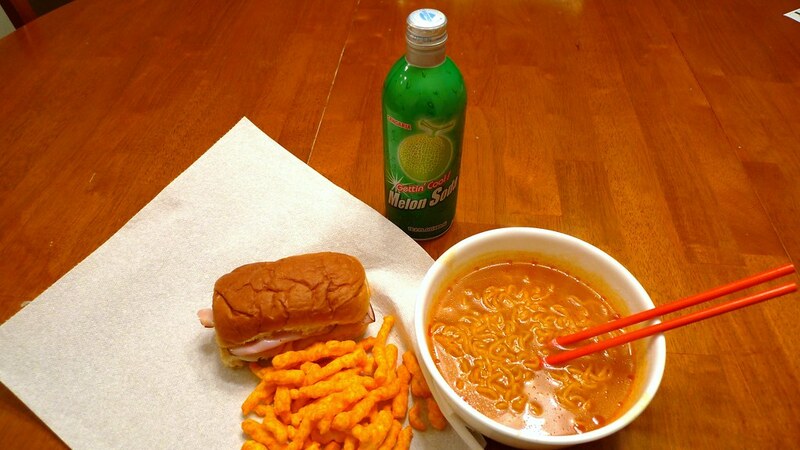 All the items you get with Pulmuone's Fresh Ramen (Mild). 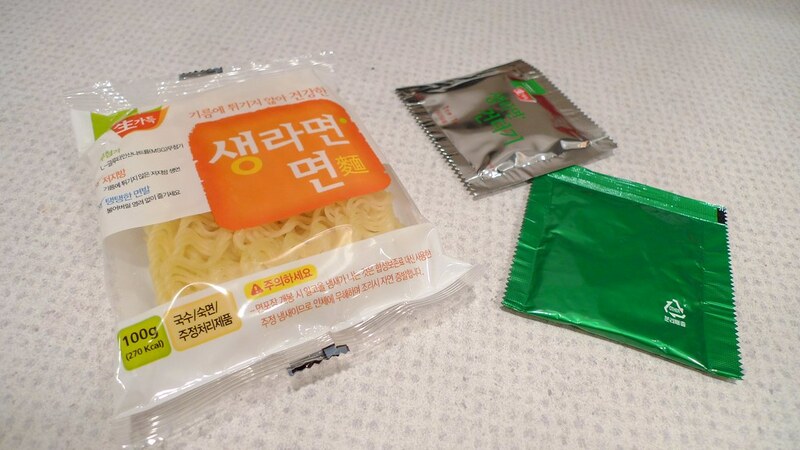 Noodles on the left, then seasoning packet on the upper-right, and dried veggies on the lower-right. I saw this one sitting in the refrigerated area of a local Asian supermarket. I picked it up for all the usual reasons I buy new ramen, i.e. to review it and hopefully find some new favorites, but also because it was on sale. I am finding that going to the store once a week warrants a different discounted instant noodle product and a thorough way of discovering new food. Cooking the brick of fresh noodles. So, how is it? Let's start with the packaging which I must say is very attractive. 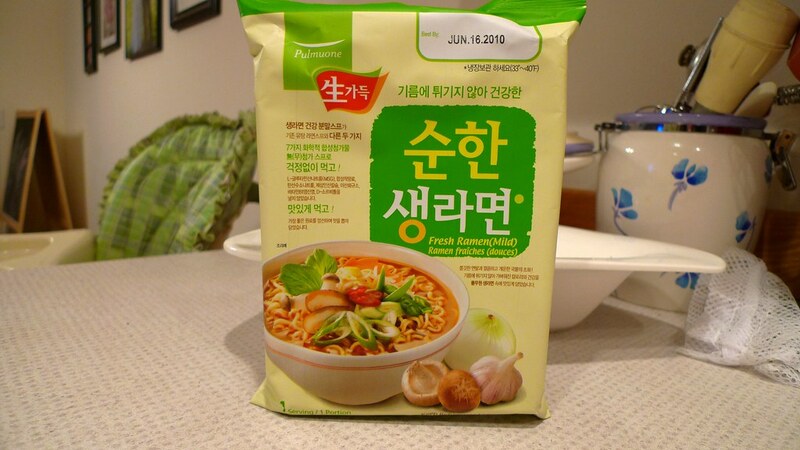 The picture on it makes it look like it'll taste similar to Nong Shim's Shin Ramyun. The individual noodles themselves are circular round like Nissin's Damae, though I would say thicker and have a nicer chew. They soak up the broth really well. 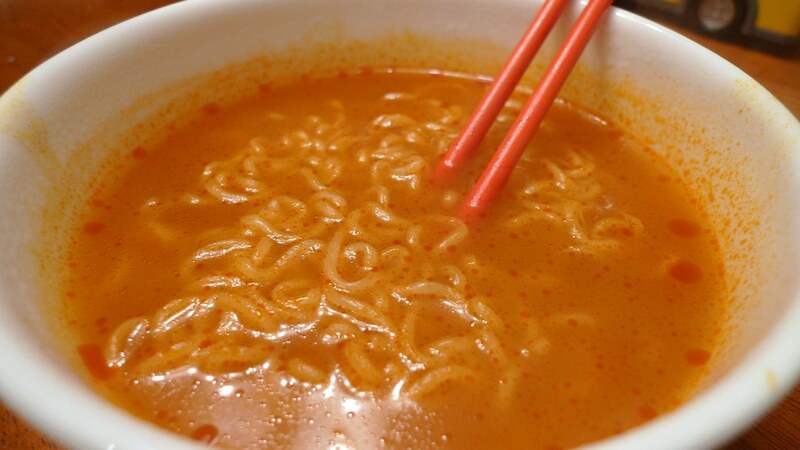 Unfortunately, the broth is pretty bland and nothing like Shin Ramyun. For one, it's pretty oily. 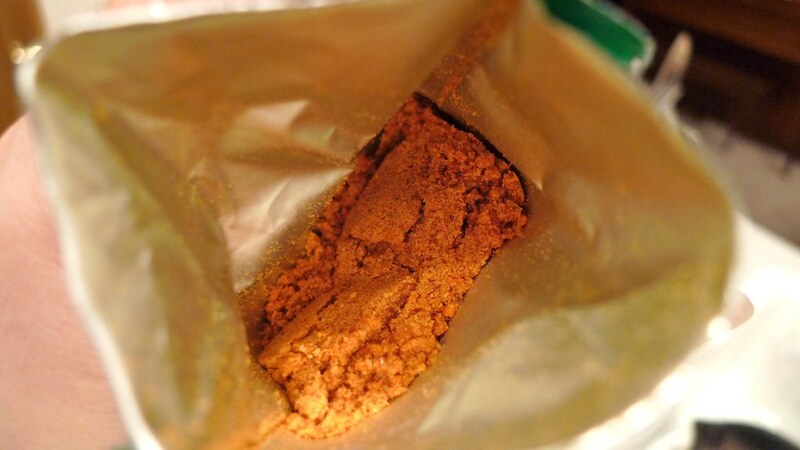 It also does have some spiciness to it, but an odd flavor. It's very oniony. Also a bit of garlic taste. 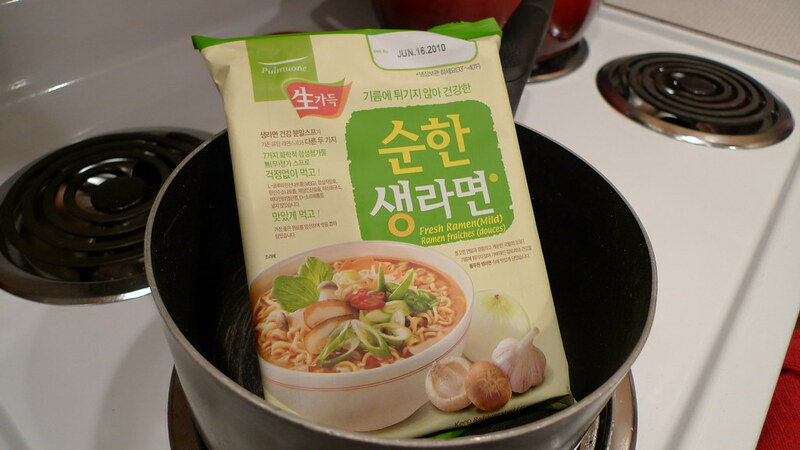 Even though there is no fish in the ingredients, I got a hint of some sort of seafood taste. Honestly, I have no idea how. Maybe the combination of some of the powders cause this. 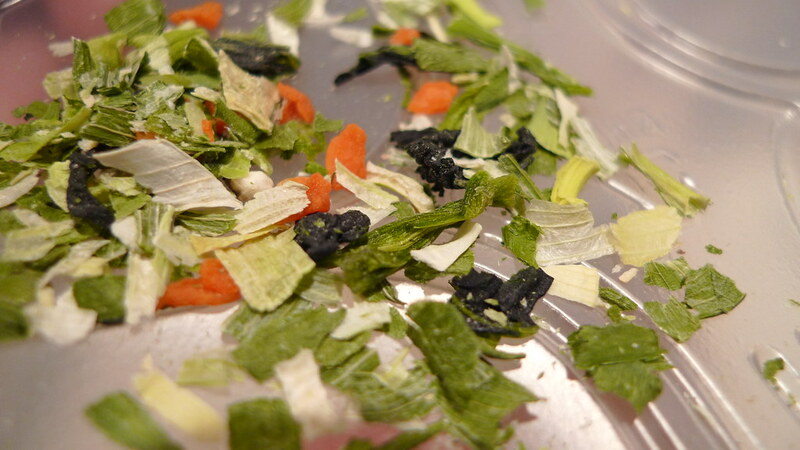 The dried vegetables packet you get is deceiving. The packet is quite large, but the contents inside are small. You could probably add some greens and mushrooms to this to make it more filling. 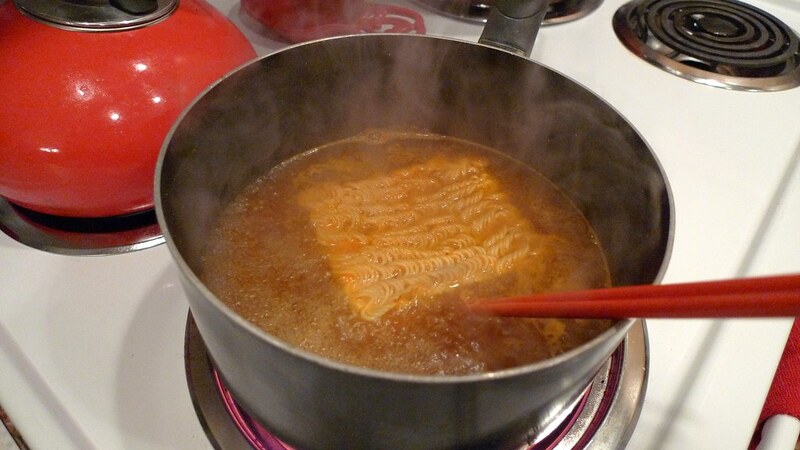 Ready to eat this "Fresh Ramen". 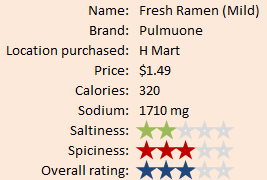 One redeeming quality of Pulmuone's Fresh Ramen is that the calories and salt content are slightly lower than your average packaged noodle, though not exactly what I would say as being healthy. It was still a pleasant meal, but not something I would eat often or possible at all again. Juliana did not have any since it was semi-spicy. Can I really recommend this one? No, but it's an alright food.